Atlanta, U.S.A, 2018-Nov-06 — /Travel PR News/ — Four Seasons Hotel Atlanta, the city’s only AAA Five-Diamond and Forbes Five-Star hotel, announces the unveiling of renovated guest rooms, suites, spa and fitness centre, and an outdoor event space. The Hotel has partnered with New York-based interior design company Meyer Davis Studio for a refresh that embodies the modern amenities of an urban hotel with improved functionality and connectivity. A portion of the room upgrades were completed in 2015, and now all 244 guest rooms, including 18 suites and five new terrace suites, have been updated with a contemporary classic motif that showcases modern design. A cool-toned palette with pops of rich burgundy and aged brass fixtures were coupled with sensibility for a refined feeling of modernity. The artwork in the guest rooms, suites and corridors was sourced from Canvas Art Consultants in Atlanta. In addition to the guest rooms and corridors, the spa, pool and fitness centre were also refreshed. New custom lockers were installed in the men’s and women’s locker rooms in addition to an upgrade to the steam rooms and saunas. The pool, which remains Midtown Atlanta’s only indoor saltwater pool, was completely refinished and paired with new lounge chairs and sectionals. The fitness centre is now equipped with state-of-the-art machinery such as Peloton bikes and SkillMill treadmills. 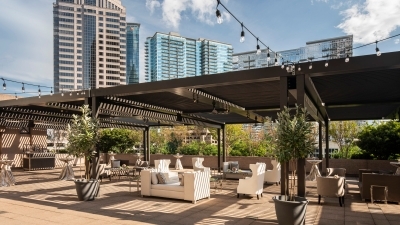 Four Seasons Hotel Atlanta’s 50th floor Penthouse Ballroom, which was renovated in 2015 and flaunts the same modern feel as the refreshed guest rooms, now ties in perfectly with the Hotel’s Fifth Floor Terrace – one of two outdoor event spaces at the Hotel. The 7,000 square-foot (650 square metre) space now features an expansive louvered pergola – perfect for outdoor weddings, parties and other special events. The Terrace overlooks beautiful Midtown Atlanta and recently hosted the third anniversary of the Hotel’s bar and restaurant concept, Bar Margot. Bar Margot, a collaborative concept by Four Seasons Hotel Atlanta and famed restauranteur Ford Fry, has remained one of Atlanta’s most popular dining destinations since its opening in 2015. Its warm velvet touches, coxy lounge seating and sleek artwork exemplify the design concept that is now carried throughout the Hotel, from the ground up. Reservations may be booked online. This entry was posted in Business, Hotels, Luxury, Resorts, Travel, Travel Services, Travelers and tagged Atlanta, Four Seasons Hotel, Gray Davis, hotel, Matthew Whitaker, Yvette Thomas-Henry. Bookmark the permalink.